In my previous post, I talked very briefly about the need to always keep learning about EVE mechanics, which is mostly not a bad thing. Learning is always good, et cetera. But it does sometimes create unintended consequences, which when they are good CCP labels as “emergent game play” and when they are bad generally escalate into “EVE players are dumb” situations. There is, in short, a science to everything in EVE. And when players know how to use these things, we say they are “good at EVE” or “smart” and when players don’t know how to use these things, we say the opposite, including labeling them as “dumb” when the correct word is ignorant. It’s not that that they’re inherently stupid (usually), it’s simply that they are uneducated. The day they learn something new, the clock I talked about in the previous post resets and hopefully they won’t make that mistake again. Certainly, there are people in this game that insist on making the same mistakes over and over. But contrary to popular belief, many EVE players are actually pretty smart and if you explain the science of how something works to them, they’ll get it and they’ll follow it. It’s just that in real-life science, things are documented. In EVE, the science of how to do complicated things are jealously guarded secrets used by the initiated against those who are not. “You can affect something big, even if you’re small,” the old Goon propaganda poster promises. What it doesn’t tell you is that the knife cuts both ways. If you don’t understand the ship fitting or how to fly it, you will probably lose the ship. If you don’t understand how the fit works within a fleet or the fleet doctrine, you endanger the fleet and risk its destruction. 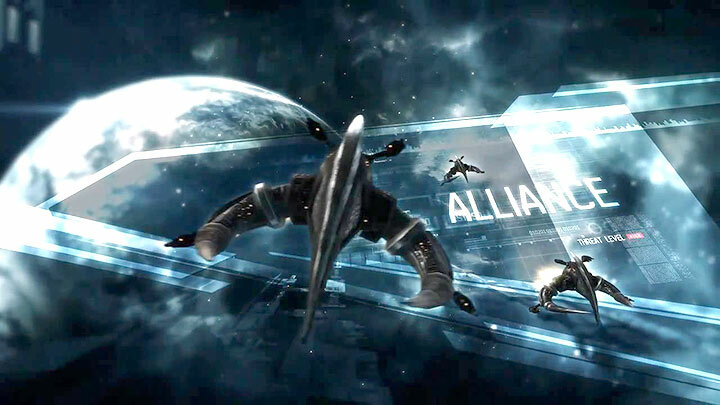 If you don’t understand how the doctrine fits within the armada, you threaten the armada. If you don’t understand faction warfare mechanics or corp mechanics or sov mechanics… well, you potentially threaten the faction, the corp, or the alliance. For every story of a hero newbie tackling a high value target, there’s another story of a newbie whose name is mud who bubbled a friendly capital or super-capital… or got an alliance’s wallet and assets stolen. And when the newer player makes a mistake that affects something big, it’s never the newer player that pays the price. The new player loses a dictor. It’s the vets that trusted him that lose billions. Or hundreds of billions. 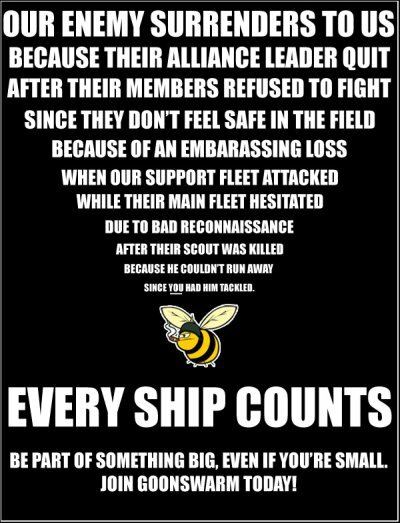 And when the newer player falls prey to the dark side of the science of EVE, we bitter-vets are always quick to throw out the “dumb” label: he was dumb to fly that ship, he was dumb to get into fleet without understanding what he was doing, he was dumb to mess with corp mechanics without understanding them, he was dumb to trust Scooter McCabe. And if all else fails, the bully’s accusation comes out, that the vet was dumb to trust the new player. But was he dumb? Or merely uneducated? And then we bemoan how few content creators — or “instigators” as CCP Seagull calls them — there are in this game. With so much science to learn and understand, and with the slightest mistake being picked up on and exploited, it doesn’t surprise me a single little bit that there are so few. Who wants to take that risk in such a risk averse game? I suspect we lose a lot of EVE players and potential EVE players and a lot of potential content creators to the science of EVE. (1) Examples: using SBUs to “blockade” your own space as a defensive measure, the old dec-shields used in high-sec, placing your ESS in a spot inaccessible to anything but a fleet, and other such tactics. Valuable information. Fortunate me I found your site unintentionally, and I’m surprised why this accident did not took place earlier! I bookmarked it. Very interesting topic, appreciate it for putting up. “Challenge is a dragon with a gift in its mouthTame the dragon and the gift is yours.” by Noela Evans. I absolutely love your blog and find most of your post’s to be just what I’m looking for. Would you offer guest writers to write content for you personally? I wouldn’t mind publishing a post or elaborating on a few of the subjects you write in relation to here. Again, awesome website! Heya i’m for the primary time here. I came across this board and I in finding It truly useful & it helped me out much. I’m hoping to provide something back and aid others like you helped me. That is really attention-grabbing, You’re an overly skilled blogger. I’ve joined your feed and stay up for in search of extra of your magnificent post. Also, I have shared your site in my social networks! I would like to express some appreciation to the writer for rescuing me from this particular problem. Just after browsing through the the net and coming across advice which are not powerful, I believed my life was gone. Existing minus the solutions to the difficulties you’ve resolved by way of your main short article is a serious case, as well as ones that might have adversely damaged my entire career if I had not encountered your web page. Your own natural talent and kindness in maneuvering everything was vital. I am not sure what I would’ve done if I hadn’t encountered such a thing like this. I’m able to at this point look ahead to my future. Thanks for your time very much for the professional and amazing help. I won’t be reluctant to propose the blog to anybody who requires guidance about this topic. I am now not certain the place you’re getting your info, but great topic. I needs to spend a while finding out more or understanding more. Thanks for wonderful information I was searching for this info for my mission. What are some excellent websites as well as blogs for budget-friendly style for adults? Leave a Reply to ganhar lotofacil Click here to cancel reply.